There are two kinds of modification you can make to a pencil line's texture. Using the Edit Gradient/Texture tool, you can scale the texture by its length and thickness, as well as offset its starting position. 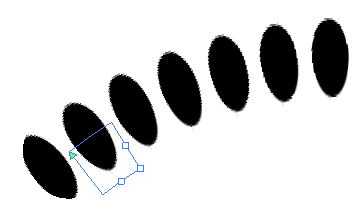 Using the Pencil Editor tool, you can change the texture's symmetry relative to the line's center. How to scale the length or thickness of a pencil line texture. In the Tools toolbar, select the Edit Gradient/Texture tool or press Shift + F3. Click on the pencil line you want to edit. Drag one of the square-shaped handles to scale the texture's length, thickness, or both simultaneously. How to offset a pencil line's texture. Drag the triangle-shaped handle to offset the texture. In the Tools toolbar, select the Pencil Editor tool or press 8. Drag one of the line's control points closer or further away from the center line to change the size of its half of the texture.